My friend Chris was in town from Cambodia this weekend so I planned a Pizza Tour of Brooklyn. Of the places on the map, we hit four (plus we made our own home-made pies). We had two categories for the pizzas we sampled: “paper plate” and “gourmet”. The former were slices, the latter where what our friend Deana would call “not pizza” (since it’s too thin and froo-froo). First stop: Pizza Plus at 359 7th Ave, Brooklyn, NY 11215, (718) 768-5327. The “local” pizzeria. This is where I buy fresh dough as well as an occasional slice or entree. Pizza Plus is one of the friendliest eating establishments in Park Slope and they make a really nice slice. We each had a half slice on a paper plate as a reference point and appetizer before hopping on our bikes. Pizza Plus still charges only $1.75 for one slice, plain cheese pizza. An 18″ pizza goes for $14 or $.05/inch. Crisp crust, excellent sauce, “too much cheese”. Next stop: Franny’s Pizza at 295 Flatbush Ave, Brooklyn, NY 11217, (718) 230-0221. Franny’s is a decided step up from your average pizzeria. The bartender was attentive and the pizza was very good, but pricey. We enjoyed the tomato and buffalo mozzarella pizza (which cost $16 or $.14/inch). The sauce was good and the crust had a nice chewiness, but it did get a little waterlogged and there was a bit of char (which is not unusual at brick-oven pizzerias, read: “Anthony’s on 7th Ave”). 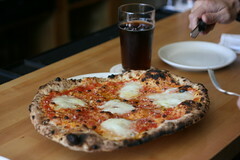 Overall Franny’s serves a solid gourmet pizza. After Franny’s we coasted down 4th Ave (passing many other storefront pizzerias) to Peppe’s, a newcomer to the neighborhood, at 597 4th Ave, Brooklyn, NY 11215, (718) 788-7333. Though we had slices on paper plates, Peppe’s pizza is definitely high-end. There was a generous sprinkling of Romano on top, which lent the sauce a creaminess that took some getting used to. Peppe was gregarious and he stopped to chat with us between deliveries. An 18″ large pie costs $16 ($.06/inch) making Peppe’s the value winner. (Read a serious review). Our final stop before returning home to try our own hands at pizza-making was Toby’s Ale House at 686 6th Ave, Brooklyn, NY 11215, (718) 788-1186. 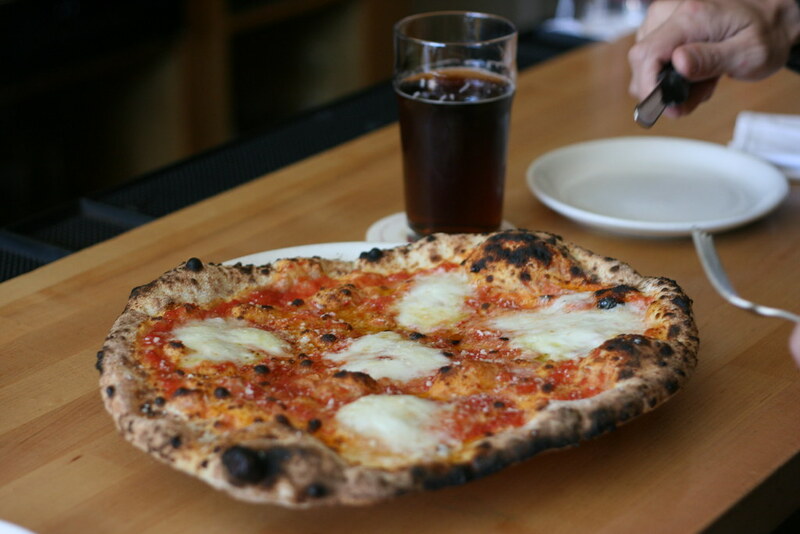 Toby’s just opened up a few weeks ago, but already they’re churning out excellent pizzas. Our group had grown to five at this point so we sampled three of their pizzas. Toby’s pies are small and priced similarly to Franny’s so bring lots and lots of cash. Though all of the pies were too salty, the buffalo mozzarella pizza was the taste winner in the gourmet category and it goes quite well with their Toby’s Cheap Ale (which, at $3 a pint, is cheap indeed). A couple of hours later and many dollars lighter, we trekked back to 7th avenue and made some pies of our own. I put together two 14″ pies for under $20, which puts the home-made-pizza-price on par with Peppe’s (though mine did use fresh mozz and included spinach). My pizza was decidedly blander than the others and had a sweeter tomato sauce since I use canned crushed tomatoes alone. The addition of spinach and subtraction of salt make this pizza the health-conscious pizza-eater’s choice, which met with general approval from the judges. However, with Peppe’s in the neighborhood, it’s going to become harder and harder to fire up the “Mark Royal” and make it myself. Update: 7/19/08. M and I went to Di Fara’s today. What you’ve heard is true. The pizza may be the best in the world. The ingredients are top-notch and the place… well, let’s just say it’s hard to describe.